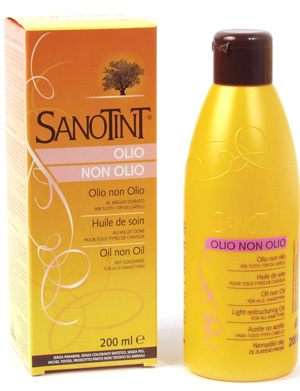 Natural Conditioners & Treatments Sanotint Hair care products Do not contain derivatives of animal origin. Does not contain added metals. You’ll love the best natural conditioner and hair treatment; it’s the natural way to bring your hair to life. Colourcare Conditioner, Restructuring Conditioner Cleansing Oil, Light Restructuring Oil, Intensive Silk Masque. keep your Hair Soft and Bright. Sanotint Colourcare Conditioner has a pleasant raspberry fragrance while it protects, strengthens and restores the natural beauty to your hair. The added sun filter makes it perfect for fighting dryness caused by UV rays. 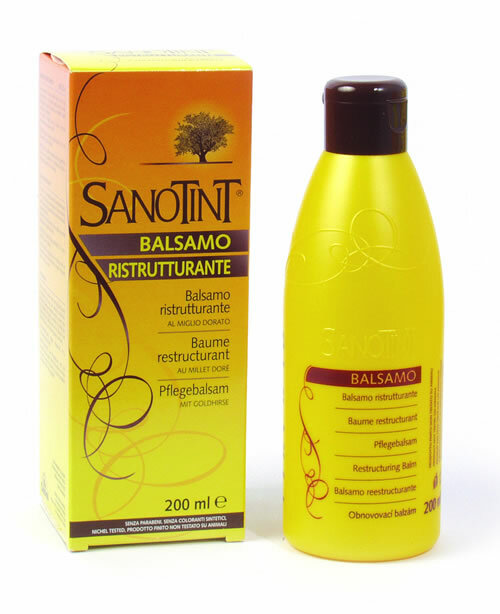 Particularly suitable for use after washing with Sanotint Colourcare shampoo, Rinsing required. Cleansing Oil ph 5.3 - 5.7 washes hair gently without stripping the fibers, making hair strong and easy to manage thanks to the presence of Golden Millet. Cleansing Oil ph 5.3 - 5.7 is a very advanced product for washing brittle, dyed or bleached hair on a daily basis. Can also be used as baby shampoo. Ideal for very fine, blond hair. Does not make hair greasy. Silk Masque 3.5 - 4 A real beauty treatment for an incredible result: shiny, easy to manage, less breakage from brushing Intensely conditioning, it leaves the hairsoft, glossy and silky. Silk Masque 3.5 - 4 contains smoothing agents that nourish and protect the hair without weighing it down, this Silk masque lightly enrobes the hair fibre preventing split ends. The hair will be nurtured and protected like never before. Its special film protects the hair from pollution and humidity. With this Lightening Kit you can lighten your own hair colour by 2-3 tones and get a customized effect. You can create streaks and flashes, to obtain natural reflections and highlights tone on tone and, following the latest trends, perfect your hairstyle. 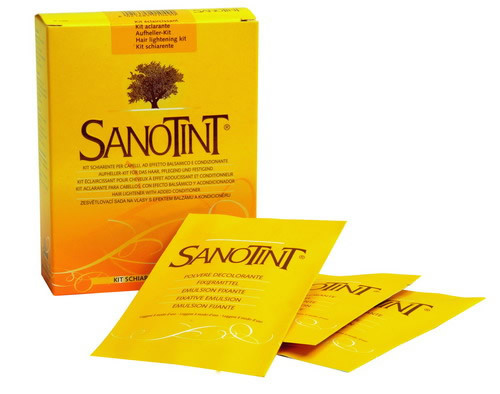 Added to Sanotint Colour, it allows you to obtain a lighter shade. 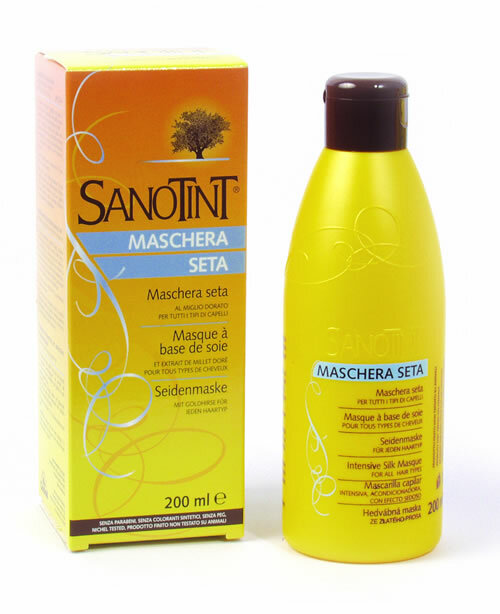 Ideal also for obtaining brighter reds if applied before red hair colouring. It also allows you to Ligthtening Kit allow you to customized effect and lighten your hair colour application whose result is too dark. Can also be used to lighten superfluous hair. The Restructuring Conditioner, Particularly suitable after hair colouring or for repeated use during the wek, after shampooing, this conditioner helps to restore vitality, softness and shine to hair. For daily use. Visible result from the first application. No rinsing required, although recommended for very fine hair. The Colour Developer/Activator liquid is great to buy when you have stubborn gray hair. The Colour Developer/Activator liquid which is mixed with the cream pigment, should be mixed at a one to one ratio. The activator is what is used to open the pours of the hair, in order to allow for the color to be deposited. The activator should not be replaced with another brand, as it is specially formulated to work with the pigment. 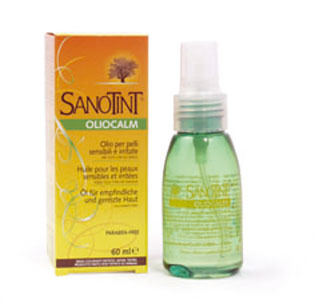 CALMING OIL helps to reduce redness and blotching. It gives relief in cases of sensitive and irritated skin. Thanks to the properties of Calendula extracts and essential lavender oil. CALMING OIL can be applied to the any part of the body in case of skin irritation. This soothing oil moisturizes skin and hair leaving a fine fragrance. CALMING OIL is produced from plant extracts and is used with hair dye or is applied directly to the skin. Light Restructuring Oil respects the skin’s PH whilst improving the hair structure. Does not irritate the skin, Does not contain colourings or additives, it is not thickened with salt, it is does not make hair oily and does not lather. Light Restructuring Oil is extra delicate non-greasy product containing the oily extract of Millet is ideal for washing hair gently without stripping the fibres, making hair strong and easy to manage, thanks to the healing properties of Golden Millet.This is a very advanced product for washing coloured, bleached, brittle, fine and blonde hair on a daily basis. Can also be used as a baby shampoo.